Continental shelf seas are extremely important because of the high levels of primary productivity that they sustain and their ability to absorb and sequester atmospheric gases including climatically important greenhouse gases. The key physical aspect of shelf seas that enables them to do so is the vertical density stratification, established throughout spring and summer when the stabilizing influence of solar radiation, or fresh water from land drainage, overcomes the destabilizing influence of turbulent mixing. In several places around the UK, such as the Irish Sea, well-established fronts form between stratified and vertically well-mixed water due to the well-understood dominant effect of friction generated at the sea bed by strong tidal currents whose influence extends throughout the water column when the depth is shallow enough. Throughout large parts of UK coastal waters, however, tidal mixing is less dominant compared to other mixing processes such as those due to surface waves, cooling and wind stress. In these regions, the competition between turbulent mixing and restratification is more delicately poised. The resulting ephemeral fronts are transient in space and intermittent in time, with important consequences for biophysical interactions such as predator foraging. To study the problem of which mixing processes dominate at these transient shelf sea fronts, we undertook extensive fieldwork at the Wave Hub site in the southern Celtic Sea during 2012. Using the Plymouth University research vessel, the Falcon Spirit (Figure 1), we measured a range of parameters using ship-based and moored instrumentation, with additional support from remote sensing platforms, throughout two, 2-week periods during April and August. Notable highlights include the continuous measurement of turbulence and related water properties throughout 8 full tidal cycles (Figure 2). 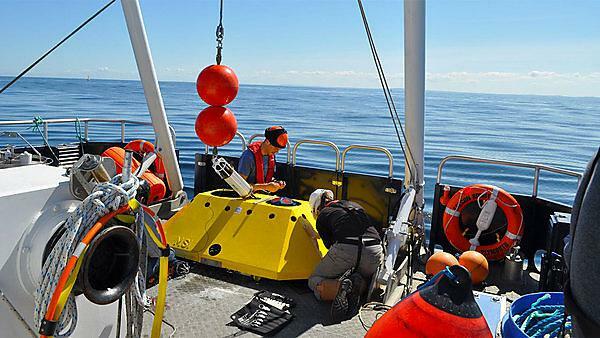 The substantial dataset acquired during the fieldwork is currently being worked up with results expected during early 2014 but preliminary observations indicate a significant role played by surface wave-induced mixing. Figure 1: Recovery of the thermistor string during August 2012 fieldwork at the frontal system in the southern Celtic Sea. In the foreground is the acoustic Doppler current profiler that had been deployed on the sea bed for the two week period for which the RV Falcon Spirit was based in St. Ives before it was redeployed for a further 4 months. Figure 2: (from top) Dissipation rate of turbulent kinetic energy (Îµ), buoyancy frequency squared (N2), temperature (Â°C) and density (Ïƒt) throughout the neap tide at the station located approximately 20 km off the north Cornwall coast. During August 2012 the settled conditions enabled strong near surface stratification to evolve. Following the tidal cycle depicted in the figure however, a strong storm passed though the study site and weakened the stratification due to the combined impact of wind, wave and convective mixing. Importantly, this resulted in the front moving offshore as vertically mixed water (in which the stratification had been eroded by the storm) extended into deeper water.